Freed from artwork data entry… for free. Xipsy allows you to privately send artwork information directly to another user’s artwork database. Never again re-enter the same details. Viable resale rights for artists and galleries. Xipsy enables you to create and manage contractual resale rights between collectors, artists and galleries. Artwork data is entered once. And only once. 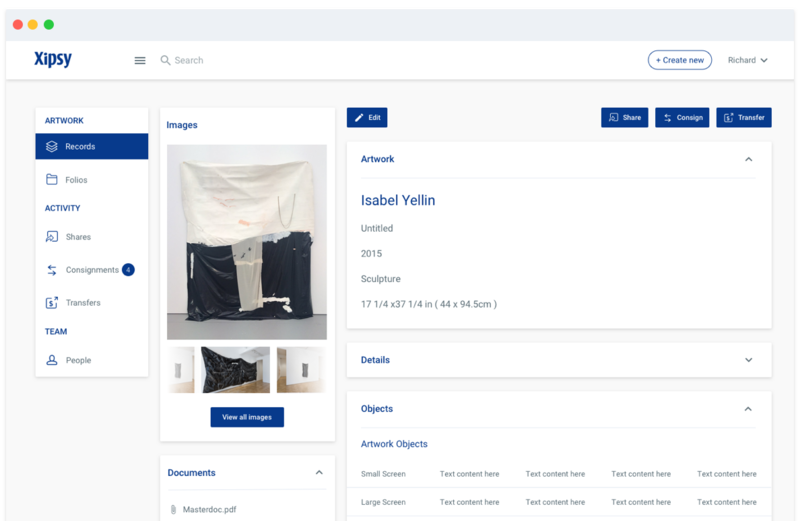 Whether you are a collector, an artist, a curator or a gallerist, you should never have to retype artwork information into a separate database. With Xipsy, the artwork details can be privately shared directly from one user to another. Share the record, as many times as you like with different permission levels for re-shares and editing. Share the record forever or set an expiration date. Artists Resale Rights Made Possible. 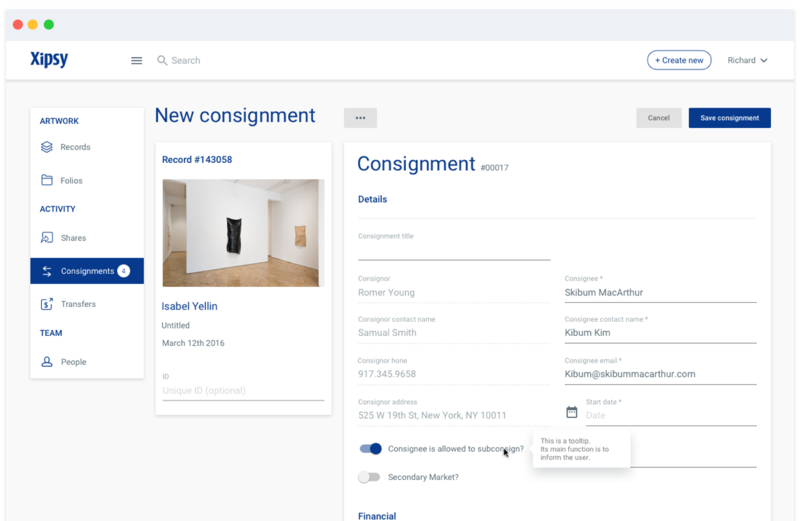 By integrating consignment agreements and artwork transfer records, Xipsy solves the problem of how to initiate and manage contractual resale rights for artists. Since each resale right is privately negotiated, Xipsy also enables galleries to participate, at their discretion. 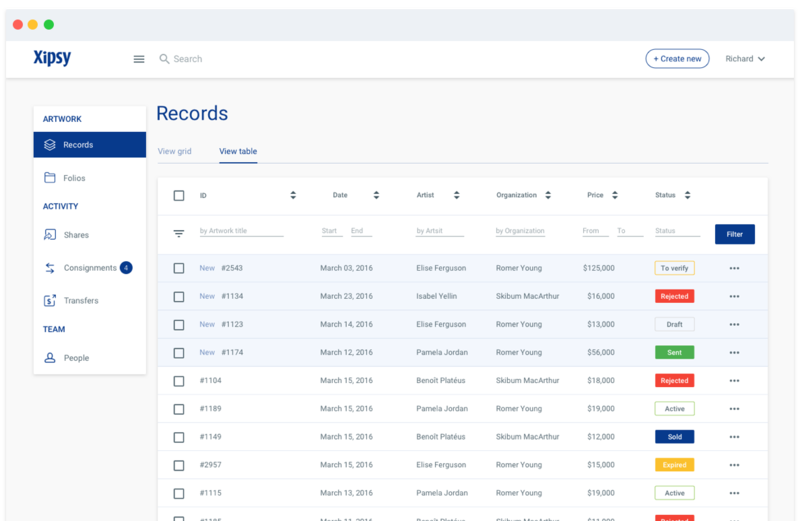 Multiple-person edit functionality allows a record to stay up to date through collective efforts. Include links to articles, exhibitions and other important provenance information. Available anywhere, anytime, for free. Xipsy is web-based and optimized for mobile, tablet and desktop. Built on modern web technologies, Xipsy is fast, secure and available anytime you have an internet connection. Every user can sign up for a completely free account. Extra storage and enhanced features may be limited to subscribers. Artwork record data prepopulates consignment agreements that are negotiated, accepted and recorded in your database. When you sell the work, the consignment information transfers directly into the invoice. Everyone has a clear and accessible record of discount percentages, expense reimbursement and other transaction details. Group works into folios and share the concept for a new show or the details for a shipment of multiple artworks. Contractual resale rights that are trackable and transferrable means that artists and galleries can monetize their Negotiated Resale Rights prior to the sale of the underlying artwork. Add multiple users to your database with varying permission levels. Whether you are running a gallery with multiple directors and assistants, or you are a collector who needs your curator and conservator to be able to access your collection, you can easily add (and remove) users from your organization’s database. Xipsy knows that the privacy of your information is paramount. While internet security is a moving target, Xipsy is committed to following best practices and updating security measures on a regular basis. Currently user authentication is performed by Devise, all passwords are encrypted using Bcrypt, and we use web data center operations that have been accredited under ISO 27001; SOC 1 and SOC 2/SSAE 16/ISAE 3402 (Previously SAS 70 Type II); PCI Level 1; FISMA Moderate; and Sarbanes-Oxley (SOX). © 2016 Xipsy. All Rights reserved.